Gallet said, "We now believe that the two towers of Notre Dame have been saved," Reuters news agency reported. "We now consider that the main structure of Notre Dame has been saved and preserved." There was still a risk that some of the interior structures could collapse, he said. The Sécurité Civile of France, part of the French Ministry of Interior, said hundreds of members of the Paris Fire Brigade were doing everything possible to get the fire under control and save the historic structure. The agency said in a tweet, "all means are being used, except for water-bombing aircrafts which, if used, could lead to the collapse of the entire structure of the cathedral." French President Emmanuel Macron addressed the nation on Monday night. 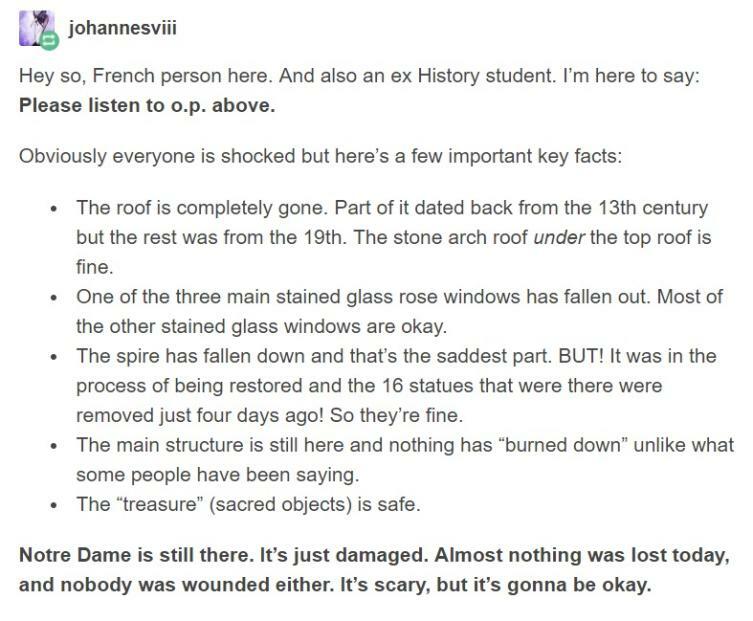 Macron called the fire a "terrible tragedy" and confirmed that the cathedral's stone facade and two main towers avoided collapsing during the destruction. The Parisians are going to want someone's head for this. "It's scary but its gonna be ok"
The historic center of Prague is probably the last example of this. Also, here are some photos of the damage.